Edwards Audio Apprentice MM review | What Hi-Fi? In the five years that have passed since we tested the Rega Fono Mini A2D, it's become our go-to phono stage costing less than £100. So it is with some satisfaction (and relief) we announce we now have an alternative entry-level phono stage we can get behind. As plug-in-and-play goes, rarely has there been so literal an example. Edwards Audio’s Apprentice MM doesn’t even have a power switch. A small red LED shines when it’s connected to the mains - once you’ve connected your turntable and amplifier, it’s ready to go. 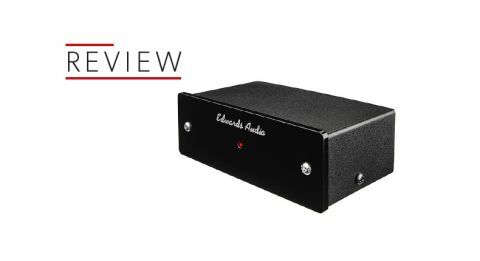 Edwards Audio says the Apprentice MM uses a circuit similar to its more expensive MM1 phono stage, with passive treble and active bass equalisation. The cost is kept down with initiatives such as the double-U case. Certainly it looks a more affordable product than the MM1, or the Award-winning Rega Fono MM MK3 - either of which require double the outlay. It’s small, but we like the Apprentice MM’s unassuming, minimalist design and the suggestion the focus has been on more than mere aesthetics. We pair the Edwards Audio with a Rega Planar 1, a perennial Award-winning turntable, which at £250 is nearing the price ceiling of the Apprentice MM’s suitable team-mates. We play The National’s Sleep Well Beast, and as the album kicks off with opening track Nobody Else Will Be There, we’re immediately impressed by how cohesive a performance we get for our money. We don’t expect oceans of space, but there is more than enough to separate instrumental lines - they knit together rather than bleed into one another. Matt Berninger’s casual, almost unemotional, baritone vocal isn’t always easy to get right, but the Apprentice MM has sufficient grasp of small-scale dynamics to frame the lilting expression even in the most placid performances. The Edwards Audio does not suffer from lack of energy, either. Tracks such as Day I Die and Turtleneck are delivered with punch and vigour - but the excitement is kept in check by a mature sense of timing. The Edwards Audio delivers a fine and musical performance, irrespective of the music it’s being asked to play. That’s the mark of a great budget product: one that can be improved upon as you upgrade the rest of your system, but still gives you everything in the meantime. If you’re looking for a phono stage to do that for your sub-£300 turntable, the Apprentice MM deserves (at the very least) to be heard.